Probably better on large view if you have a moment. Thank you. I went to Pitstone on Sunday evening for some windmill therapy. Ambling along the path, looking, taking a few photos, and breathing in the calm there is wonderfully relaxing and refreshing. Edit. If you have a moment or two to kill and fancy a look-see, my other Pitstone windmill shots can be accessed via "ab pitstone windmill" in the tags for this one. AhhhhH! Such a beautiful sight! The sky is magical and the scene is magnificent! FAV! Absolutely beautiful. Nice composition. The windmill and it's sails really stand out against that sky. What a breathtaking capture. The thistle draws you along to the windmill set against that beautiful sunset sky. A Fav! @claireuk Thank you, Claire. No, sadly the mill's nowhere near Hungerford. I haven't been to the house at Avebury but the stone circle there is beautiful, although nothing like Stonehenge. Instant Fav from me for the glorious composition and colour. This looks like it should be the cover of a book - it's stunning. What wonderful colors and those sails against the gorgeous sky make a fantastic composition. Stunning,an instant FAV,Alison,the mill looks lovely against a beautiful sky!! I saw this on FB and just KNEW it would get lots of favs. Incredible shot, Alison perfect in every way including interest! Fav, of course. Wow, wow, wow... this shot is superb... Love everything about it. FAV. Congrats on the PP ,Alison!! Superb pastel shades, great image. So beautiful - love the path leading to the mill, and the delicate sky. Well done on the PP - fav! Gorgeous capture and lovely colours. In reply to your comment about the flowers on top of the rubbish mound. I didn't didn't describe it very well. The public were actually invited to bring along their rubbish to make a mound. They wanted to show that it could be hidden and made to look beautiful - I think they succeeded. 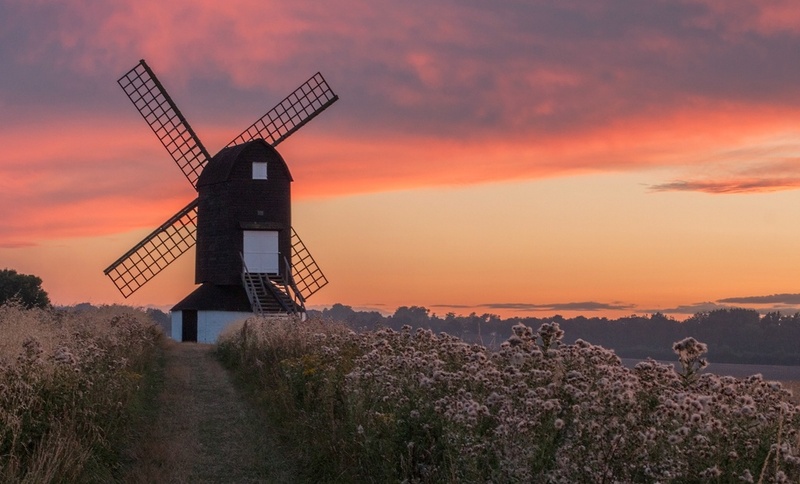 Such a wonderful sunset encompassing the windmill. I agree it is amazing enlarged. FAV Congratulation on PP. Fantastic windmill. This is different than I am familiar with and so very colorful. Love it at sunset. fav. Really lovely shot and beautiful colours. It would look great framed on the wall. Wow! This is gorgeous! Fav! Lovely photo. Fav for me too! And I'll add my fav too! Fav. That is an awesome shot.